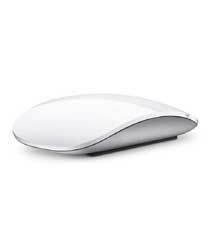 It’s lighter, has fewer moving parts thanks to its built-in battery and continuous bottom shell, and has an optimised foot design — all helping Magic Mouse 2 track easier and move with less resistance across your desk. And the Multi-Touch surface allows you to perform simple gestures such as swiping between web pages and scrolling through documents. Magic Mouse 2 is ready to go straight out of the box and pairs automatically with your Mac. Please note: This product is currently only available in MLA02ZA/A.